Like her characters, Di loves her family and friends, beautiful shoes, anything sparkly, the 'occasional' drink, parties, and a good belly laugh. She's addicted to shopping, chocolate, bubble baths and anything else that smells nice, and trash TV. Di has lived in England, Canada, and the United States, but now calls New Zealand home. She lives in a lovingly renovated farmhouse with her Great Danes Dolce and Gabbana, and their two cats Charlie and Jamie. The dogs keep her fit and exercised, scare the burglars away, sit loyally by her side throughout late night writing sessions, and hang on her every word when she reads final drafts aloud. They truly are her biggest fans, and she theirs! The cats, on the other hand, hang out by themselves and ignore Di and the dogs. 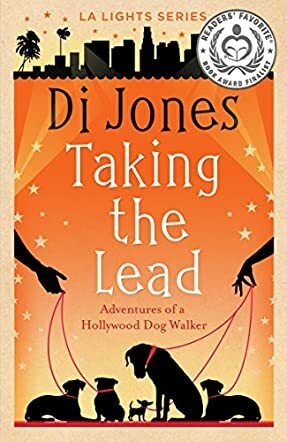 Taking The Lead: Adventures of a Hollywood Dog Walker by Di Jones is the novel of every dog lovers dream, especially people like me who love dogs and just can’t have them. This novel is an absolute gem. What should I talk about first? The dogs, or the characters, or the chapter names? Oh, the chapter names. Di Jones must be the master of pun and irony. I am officially in love with the way she writes and the only other person I have said this about is J.K Rowling! The story is about Tessa, a girl with dreams of making it big in Hollywood. But things are not that easy. Times get tough and she is desperate to make ends meet. Her life takes a turn for the better when she gets a job as a dog walker. She finally has a chance to make something out of her life and dreams, and if she plays her cards right, she might even get a hunky man out of it. Let me start with the dogs; they are full of character. Twinkletoes is awesome. That Great Dane is a dream pet. And all the other dogs mixed with Twinkletoes gives you the right kind of humor and mischief that just makes your heart melt and have you grinning like a fool. I loved, loved, and loved reading this novel and I cannot wait for more from Tessa and her dream of making it big in the Hollywood. I hope I don’t have to wait long for a sequel. I was pleasantly surprised by the realism portrayed in this book, showing a girl following her dreams, no matter where in the world those dreams take her. Di Jones seems to have the knack of pulling the reader into the storyline so much that they fully empathize with each of the characters. I felt hopeful, dejected, excited, frustrated and almost cheered out loud when Tessa joined the cast of the show. Taking The Lead: Adventures of a Hollywood Dog Walker is a tumultuous story of a young woman who is willing to leave the security and comfort of living with her parents and say goodbye to her schooling in order not to pass up the once-in-a-lifetime chance to embrace life on the small screen. I recommend this wonderful story to any reader who enjoys a huge dollop of comedy served up with their fun and inspirational reading.